I spent most of the week visiting my sister and brother-in-law in Vermont. 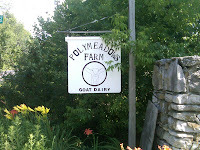 They are dairy goat farmers, owners of Polymeadows Farm. 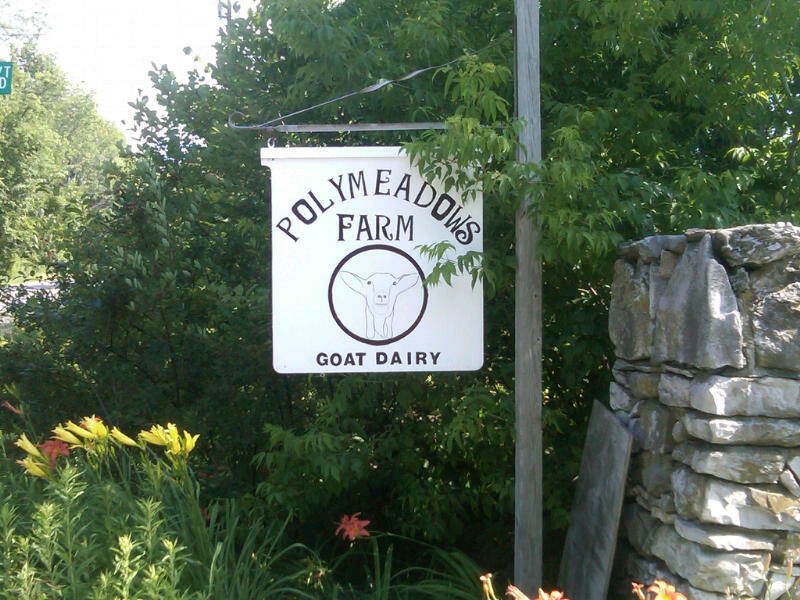 They sell their products all over New England; Polymeadows milk and yogurt even make it down to New York City. I love visiting the farm, even if it means I use muscles that have lain dormant since the last time I was there. Carrying 60 pound bales of hay and 5 gallon buckets of water takes some getting used to every time, and the 10 gallon milk cans just about defeated me this week. And this year I was using muscles that I haven't used since my kids were small, because my sister's one year old grandson is there now and I carried him around a lot. He loves doing chores with his grandmother. They go out together every morning. He sometimes gets a little frustrated when she won't let him carry the eggs he finds in the chicken coop, but that quickly passes and he delights in feeding the goats, filling the water buckets and the baby goats' milk bottles in the milk house, and sprinkling grain for the roosters that wander around the yard. One day he's hoping he'll actually touch one. He's learning to do chores in Spanish, so he points at the goats, and each morning smiles as though it's the first time he's seeing them, and says, "Cabras, cabras!" The three of us wandered up the lane one morning after breakfast to pick black raspberries. They were at the peak of ripeness and there were a lot of them, and that made a one-year old very happy. We all picked for half an hour or so, some of us eating a lot more than the others of us and turning blue. When our helper got tired I brought him back to the house, and went back up the lane to do some more picking. The berries are all in the hedgerows between hay fields, where the mower doesn't reach, richly biodiverse strips of land. There are grape vines there too, climbing over the aging, gnarled trees that haven't yet died and been split for fuel for the outdoor furnace that heats the houses in the winter. My sister makes jam from the grapes and black raspberries every year, and it's the best. We walked over the hill and down through two or three fields looking for berries where she's found them in years past. The berries and grapes all happily co-habit, along with the cherry, spruce, ash, oak, maple, and poplar trees there. Or they did until two invasive species came along, taking root up and down the hedgerows and slowly suffocating much that has been living there for centuries. These are oriental bittersweet and poison parsley (also known as poison parsnip). Many of the black raspberry bushes my sister once knew to be fruitful are no longer bearing, or aren't even there any more, and more and more of the grapevines are being crowded out. Invasives are species that are particularly aggressive when introduced to habitats outside of their usual range. They often out-compete local species because there are no predators in the adopted habitat or because they grow faster, or in a more diverse habitat. Ultimately, invasives can choke out native species, leading to reduced biodiversity. There is apparently a fledgling movement afoot to beat invasives by eating them -- invading fish, animals, plants beware. Here's the Top 10 edible invasives list. Note that neither poison parsley nor oriental bittersweet is on the list. Poison parsley is in the carrot/parsnip family, related to Queen Anne's lace (also called wild carrot) and the very toxic Giant Hogweed. Apparently, some parts of the plant can be lethal if eaten -- there are stories about cows and people killed by this stuff, but the roots are edible. They're parsnips, much like the parsnips you buy at the store -- this is one invasive that escaped from horticulture. The sap, though, can cause severe burning to the skin, but it's phototoxic, so it only burns where it touches you on a sunny day. My brother-in-law says that years ago when his father was growing corn in the same fields where he now mows hay, and dosing it with herbicides, it was the 'superweeds' that survived. Then it was velvet weed, and when they stopped growing corn and planted things like alfalfa and orchard grass instead, and stopped using herbicides, the velvet weed disappeared. The poison parsley has been up in those hedgerows for a long time, and he thinks it probably took hold in the old corn days. It's not in the fields because they get mown and it needs to go to seed to propagate, but it sure is happy in the hedgerows. He knows about superweeds from experience, but he's not the only one who says this. Herbicide-resistant weeds are an ever increasing problem, one we blogged about here. In competitive Darwinian terms, in the short run, invasives can win and win big. That is, those introduced plants that do get a foot-hold. Most incomers might be driven to local extinction. But if an invasive has some advantage, they garner the most resources, reproduce best, spread the fastest, and out-compete many of the native plants in a given habitat. Perhaps they have ways to extract resources, or avoid competitors or predators, that plants in the local stable ecosystem didn't have and hence were not equipped to resist. The resulting reduction in biodiversity that can happen when a highly successful invasive takes hold explains why there is such intense interest in getting rid of them, or preventing their spread in the first place. Their success isn't necessarily because they adapt to their new environment with genetic changes, but rather it can be a combination of not being very picky about where they live and having no predators in the new habitat. Rather like humans, as we elbow our way into every corner of the globe. We can live in very different environments because we are able to exploit many different food sources, and because we have tools and culture and can find ways to survive in many different climates. With successful invasives there is no 'adaptation' of the usual kind needed: the incomers' nature simply allows them their advantage, without the need for new mutations or variation to be selected for over generations. That may apply to mutations in viruses or bacteria, where selection and spread are very fast. But if classical 'Darwinian' evolutionary adaptation were required, most incomers would be driven back out long before they could adapt, or their adaptation would take much longer than documented recent invasions. Perhaps that history is very misleading about the dynamics of invasions not made possible by quick human transport and so on. But perspective is important here. In the long run, the picture can be quite different; the invaded habitat might itself adapt to the invader. This has been true, e.g., after invading fire ants have decimated an area of other insect life. In the short-term, it looks like the fire ant has won, but years later the local insect populations that had been reduced in number may well bounce back, to co-exist with the invaders. Or co-exist because the invader was a selective force that molded changes in the host-land species. But how long does a species have to be in a place before it's considered 'native'? Many species that we think of as native were once invaders. Again, including humans. So, many 'native' habitats are only so by our short-term definition. I hope the grapevines up the lane behind the barn at Polymeadows, native or not, aren't squeezed out entirely by the invaders. Wild concord grapes make much better jam than do parsnips. We have that everywhere along the road sides in Canada in about 2 years it has changed from a non-issue to a huge problem, we call it Wild Parsnip/Parsley. 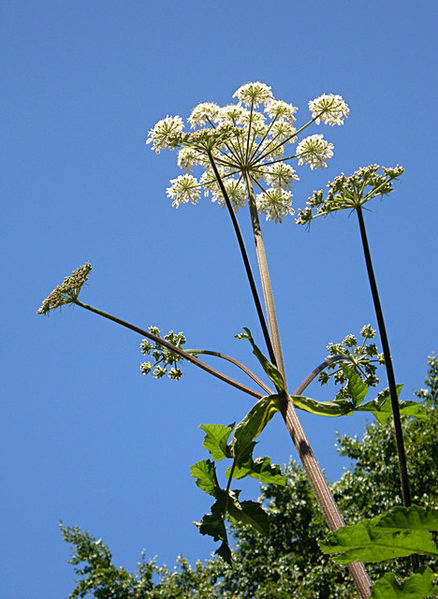 Giant Hogweed, a much larger problem is spreading too.